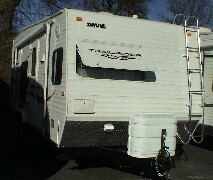 Model 219 ALJO Trail Rider Way-Lite 25'6" Travel Trailer; or NOMAD Rampage or LAYTON Freestyle by Skyline This new model for 2009 is like no other. The theme is industrial strength with diamond plate protection and accents The fold away seating and dinette is grey on black steel frames and convert for sleeping. 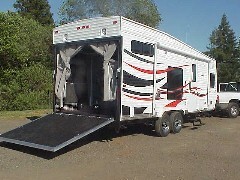 There's an electric drop-down bunk over the fold-up rear ramp making this lightweight sleep six. A optional & unique second drop down 'Magic Bed' brings sleeping to eight. Up front is the galley with it's own front window and a full bathroom. 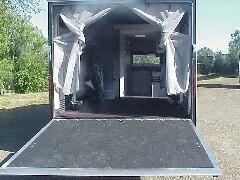 Chrome wheels, awning - lots of lighting finish it off. 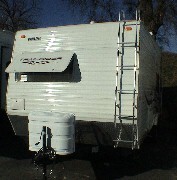 The roof ladder is mounted on the front as well. The high-tech ammenities include a fueling station and Onan Generator. Weight is 5200 so it's an easy pull. NOTE: Trail Rider is available with Oak or Cherry wood decor.